Switching from rice milk to almond milk to cut calories and added sugar in my diet. Gradually increasing how many servings of vegetables I eat every day. I always ate enough fruit, but now I eat the recommended number of vegetable servings, too. There have been many times when these sites suggested an ingredient tweak, a new recipe, or a workout routine that ended up working wonderfully for me. Some of them required a period of adjustment in the beginning, but I was soon able to adapt to them by keeping an open mind on changes that sounded even mildly interesting. With that being said, there are a few things that I’m never going to stop eating because of how much I love them. I’m sharing them with you today to remind you that you don’t have to give up your favourite foods either. With an adjustment in how you make them or how often you serve them, anything can be part of a healthy diet. 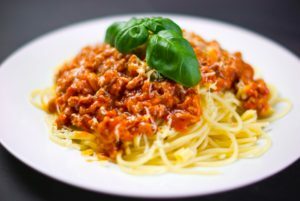 A couple of years ago, I began stumbling across articles about people who peeled vegetables like zucchini into noodle shapes and then served them with spaghetti sauce on top to reduce the calorie count of this dish. They called those noodles “zoodles,” and some of the sites I follow posted multiple entries about different ways to prepare and serve them. I think it’s great that they found a way to make a lighter version of spaghetti, but I will never make that same switch. Spaghetti is one of those meals that I really look forward to eating in the autumn and winter because of how much I love it. While I was perfectly willing to switch to whole wheat noodles and replace some of the meat in my sauce with extra chopped vegetables, I’m only interested in eating spaghetti if it has real noodles in it. Yes, there are low-calorie, sugar-free syrup substitutes out there that taste okay. I’m glad that people who are diabetic or who watch their calories closely can enjoy something similar to it without raising their blood sugar or eating more than they should. 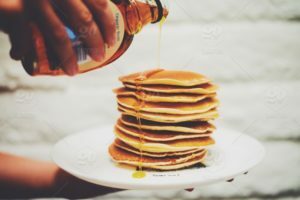 I love maple syrup so much, though, that I’d much rather enjoy the real thing sparingly than have pancakes every week with imitation syrup on them. The sugar and calorie content in maple syrup is high, so I generally only have it a couple of times a month during the cold season. When I do treat myself with this meal, I serve it with homemade whole wheat pancakes and sliced fruit. This makes this dish more filling and nutritious. The fact that I have it so sparingly also makes it even more special when I do decide to make it. As I’ve mentioned in previous posts here, I cut back on the added sugars in my diet a few months ago. 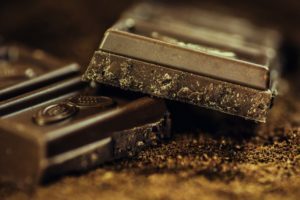 Chocolate and other sweets are a rare treat for both physical and mental health reasons. When I do indulge in them, I go straight for the good stuff. If I’m going to eat chocolate, it will be something out of the ordinary. Most chocolate bars out there contain milk ingredients, but some of the speciality ones are surprisingly safe for me. I like dark, rich chocolate that satisfies you with a few small squares of it. Often I’ll choose dark chocolate that has nuts or dried fruit mixed into it. I’ve even found one brand of “milk” chocolate that’s safe for me. It’s specially marketed to people who are vegan or allergic to milk, and it’s delicious. Some of the bars I love the most are between $5 and $10 each. Since I only eat them a few times a year, that splurge is more than worth it. My other big indulgence is candy corn. I currently have a few containers of it squirrelled away in my cupboards now that it’s available again. I’m going to try to make them last through the winter. It’s not something I’ll eat every day, but it is something I’ll nibble on now and again. What Do You Refuse to Give Up? You don’t have to give up everything you love in order to become healthier. In fact, cutting all of the treats in life is a great way to crash and burn in a few days when your self control runs out. Maybe some of the things I mentioned today are foods that you’re also determined to fit into a healthy diet. If so, cool! If not, what small changes are you able to make to your diet and daily habits? What favourite foods or drinks are you never going to be willing to give up?